I have always had a fair clear skin. Pimples, white heads and black heads was never a problem for me. But I noticed that as I age, my skin becomes oily and a pimple or two would appear every so often that i resorted to consult a dermatologist to remove the blemishes that those pimples leave as a mark on my face and to prevent them from coming back. to further enhance the effect of Diamond peel that eventually led to a softer and clearer skin that I used to have. I was so happy with the result but only to find out that it’s just temporary. I don’t have a budget for the maintenance so I stopped. And just three months after I stopped applying the day and night beauty regimen that the dermatologist have prescribed, I had a pimple breakout again and I tell you it’s not a pretty sight. I didn’t know what else to do and since it’s not my priority, I don’t have a budget for that. 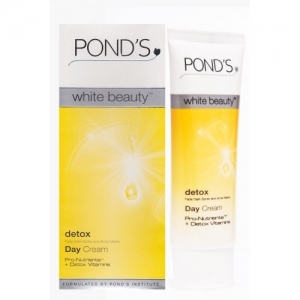 My gay younger brother had been using this Pond’s White Beauty Detox for several months now and I can see that although he does not have a fair skin, his face has this rosy while glow. He then encourage me to use it to help whiten the blemishes and to give my skin a rosy white glow too. Scared as I am, I give it a try and wow! It brought the same amazing results that a costly diamond peel does but cheaper. The smell of the cream is very pleasant that you wouldn’t mind putting it twice a day on your face for the rest of your life. The matte finish is just perfect for me since I don’t really wear heavy make up, it acts as a base and it blends pretty well with my lip and cheek tint. darkening while I’m on treatment unlike the beauty regimens that I previously used which leaves my face oily and requires me to put sunscreen at least twice a day to protect my face from darkening. I am so happy with Pond’s White Beauty Detox. Although, it takes a while before I achieved my desired results but it definitely is a keeper for me. Not only that it is effective but it is also cheap. This a great value for money and I would definitely recommend it to everyone.